Regular readers of my blog will know that I like to use up my left overs. On Friday night we had Lamb Curry which had been made from the left overs of the lamb leg we had at Easter and had frozen. There was some of the curry still left from last night, so I decided to make it into a kind of pasty for lunch. I was going to make pastry, but forgot to defrost the butter so, with a bit of lateral thinking, I thought Naan - pizza - calzone! I made my dough in the bread maker on 'dough' setting, which involves throwing everything in there and switching on. However, if you want to do it the hard way, it's just a basic white bread but with milk and yogurt as the liquid. 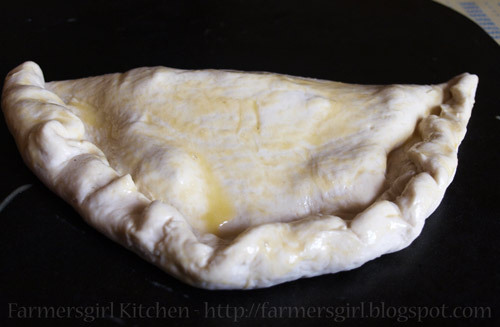 Once the dough is made, split it in two and roll out into a large round. Add the filling (anything will do, mine was leftover lamb curry, but whatever you have) and then fold over and crimp the edge. Leave to rise in a warm place for about 30-40 mintues. 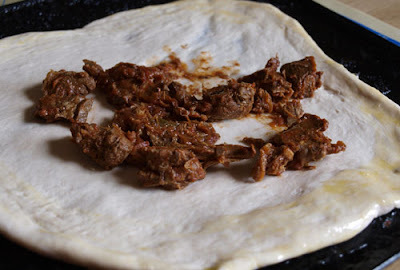 Pre-heat the oven to 200C, put the Naan Calzone into the oven and bake for 15-20 minutes. 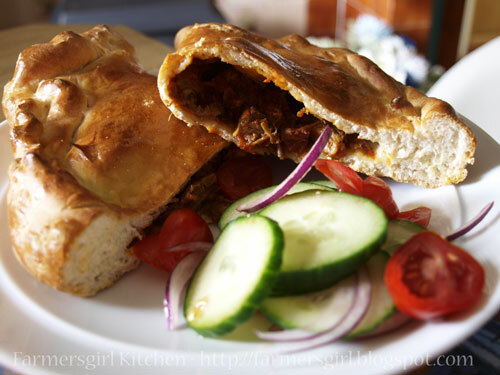 Serve with a tomato, cucumber and red onion salad. 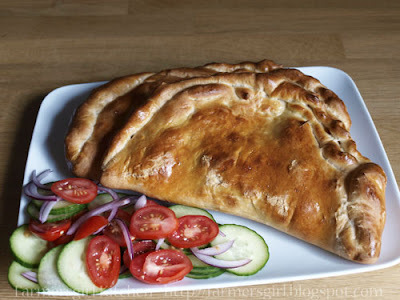 If anything I think I probably made the Naan Calzone too big, there was too much bread and not enough filling, dividing the dough into three would probably be better and would provide a better balance of filling to bread. Genius! I think you've invented a new food fusion! Italindian!